Lisa Scottoline has thrilled millions with her emotionally-charged novels that feature strong women exploring the boundaries of family, justice, and love. 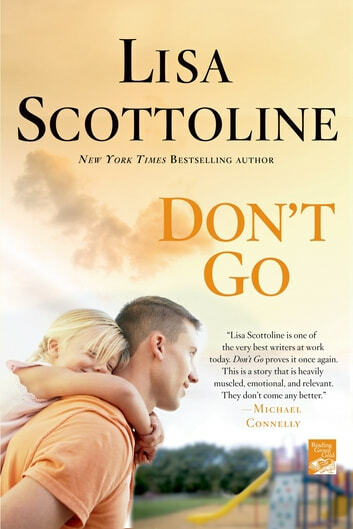 In her New York Times bestseller, Don't Go, she breaks new ground and delivers the story of a soldier who discovers what it means to be a man, a father, and ultimately, a hero. Ultimately, Mike realizes that the most important battle of his life faces him on the home front and he'll have to put it all on the line to save what's dearest to him – his family. Gripping, thrilling, and profoundly emotional, Don't Go is Lisa Scottoline at her finest. A real page turner from beginning to end! Many twists that keep you guessing what will happen next. Great page turner until the very end! As always, I enjoyed this one just as well as all the others. Can`t wait to read my next one "Mistaken Identity"! Interesting book, but slow story development in part one. Overall an okay read. Lisa is quickly becoming a favorite author of mine. This particular book had many beautiful twists, turns and poetic pieces of wisdom about family relationships.